The Coopered Tot: Balcones True Blue - a floral citrus blue corn eau-de-vie with kicking dusty Texas terroir. Balcones True Blue - a floral citrus blue corn eau-de-vie with kicking dusty Texas terroir. If you haven't yet heard of Balcones Distillery you should listen. It's clearly one of the leading lights of the American craft whiskey movement. It has recently won a slew of awards including double gold in SF and a number at the American Distilling Institute's 6th Annual. They are famous for a number of interesting concoctions including Texas Single Malt (a true malt whisky), Rumble - made from sugar, honey, and figs, and several corn whiskys made from, uniquely, blue corn: Baby Blue - a young expression, True Blue - a more mature cask strength expression, and Brimstone - a uniquely smoked expression. I liked Brimstone - and have grown to like it a lot more over the past month as I've gotten used to its intense and totally new flavor profile. 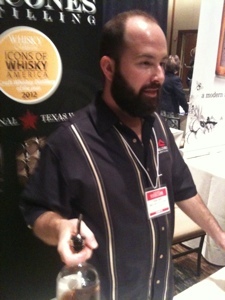 But my big conversion experience was at Whisky Live where I was able to sample the Balcones line. I was particularly blown away by Rumble Cask Reserve and True Blue. More than just big bold unique and new flavors - there was serious refinement and clear crafting and barrel management taking place. I took a sample of True Blue for this review. Balcones True Blue 61.5% abv 100% blue corn mashbill. 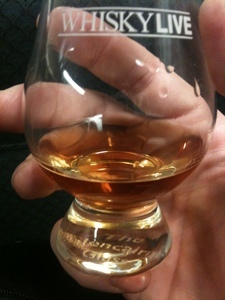 Nose: A gentle version of a bourbon nose at first: leather, peach, sandalwood, toffee and a hint of char. With time it opens to floral notes (roses and lilies), jammy orange, some high prairie dust, candy box / Turkish delight aromas and fresh sawn oak. 15 minutes more and it's starting to fade leaving cognac-like citrus (orange) and some beer wort (a yeasty, malty note) - very gentle - with some meaty ham notes in the rear. Later on the wort note seems to come and go it's mainly leather, cognac citrus, hammy warmth, and distant floral spicy sandalwood. Entry is big, as you'd expect from the 123 proof. Intensely sweet with jammy citrus notes up front and confectioner's sugar in the expansion (an inversion of the expected flavor development across the palate where sweet usually comes first then fruit). Then the peppery heat hits and gentle raw corn follows. The corn note becomes more pervasive with each sip: a robust sturdy dried blue corn flavor that is rich and sweet with a savory note and a bit of dark mineral bitterness at the back. The finish has a kiss of oak and a lingering bit of oak char. The finish is moderately short but leaves you with more of the corn than wood. This tastes young, but noble. More of a high-end blue corn eau-de-vie than a bourbon. Each sip drills the palate progression: citrus floral sweet opening, confectioner's sugar and powerful pepper kick mid-palate, then corn and more corn fading into gentle sandalwood oak with a drying mineral tinged dried corn finish. You are left with a lingering coating of powder sweet and mineral Texas dust flavor after all else has faded away. I noticed this dust flavor in the endless finish of Brimstone too. It's like the mesquite powdered soil of West Texas scrub land. (Yet isn't - because Balcones is in the middle of urban Waco - in central-East Texas). True Blue is a triumph of the blue corn flavor signature and some kind of Texas terroir. It's delicious. The whole presentation comes off as very refined and elegant. There's something weird and wonderful about the taste of blue corn elevated in this lofty refined cognac-like way. It's a little like a booze version of a pop-art masterpiece 11 foot high photo-realistic painting of a salt shaker. Blue corn is humble and American. My associations are old time Thanksgiving centerpieces, hand ground Indian tortillas, and blue corn corn chips. Now I have a new reference point, a gentle, floral fragrant lyrical spirit with a big punch and a big raw dried corn flavor called True Blue. Chip Tate, Balcones' master distiller, has taken something earthy, simple, and uniquely American and made high art out of it. This is yet another landmark totally new flavor profile in an American craft whisky for Balcones. This kind of innovative creative spirit craft is why American craft spirits are the cutting edge these days. Bravo!